After a long weekend, its back to the ‘grind’, and time for a Geekly Review, but tis a bit of a short one this week! This weekend was a break from the norm of Geekery, as me and my girlfriend and two other friends took a trip down to Cornwall, to the little village of Porthscatho. We headed down late Thursday night, arriving at around 11PM. I actually really liked that we got there late, as we couldn’t see the view due to it being pitch black. But we were treated to some amazingly bright stars. Us being City folk, we don’t usually get to see as many stars as that. It was therefore not until we woke up to some glorious sunshine, that we got to see the brilliant views around us. Most of the weekend was spent chilling out, having some drinks and playing some board games. Sometimes there is just nothing better than a good board game, and we had a lot of laughs playing Trivial Pursuit (80’s edition) and Articulate, my particular favourite was trying to describe a Rhino, “Like a Hippo but with horns.” The answer I got was “Rhinocorn”. On Saturday we were joined by another couple, who me and my girlfriend have only met a couple of times at various parties. We all went for a nice long walk along the coastline and the beaches. Then had a quick stop off at the pub. Followed by more drinks and food and games in the evening. All in all, it was a brilliant weekend, with great company, we all got along great, not that we wouldn’t anyway. 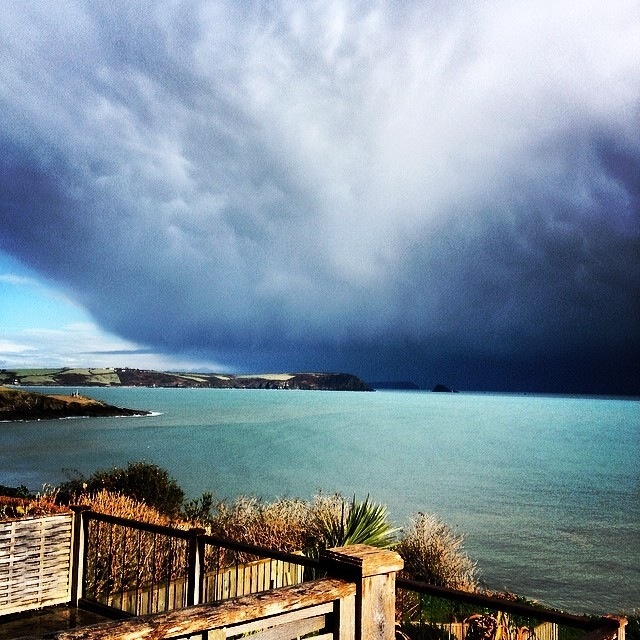 I’m really looking forward to going back in the summer time! Amongst all of this is still made a little time for some Geekery. I made a start on reading Nowhere Men. This is a comic I received as a Christmas present, but just hadn’t got around to reading yet. 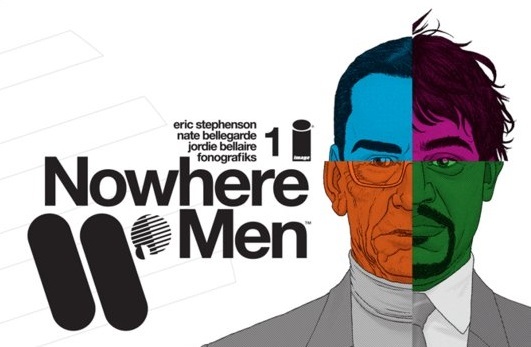 Nowhere Men is about a group of four of the world’s best scientists Dade Ellis, Emerson Strange, Simon Grimshaw, and Thomas Walker, who start the company World Corp. This company goes on to become the most successful and influential company in the world. In this world science is seen as the ‘new Rock & Roll’, and Scientists are basically celebrities. With so much fame comes problems and along the way, cracks start to appear in the friendships of the four. This eventually leads the them going their separate ways. Meanwhile something is going terribly wrong the International Space Station. A group of scientists, working for World Corp. (secretly of course) have managed to contract a virus. This particular virus seems to be affecting the crew in different and very strange ways. Due to the viral breakout they are informed that they have been quarantined and will not be receiving help from anyone, any time soon. From here things go from bad to weird, but in a really good way. So far it’s a fantastic read, and it kind of reminds me of Black Science, mixed with TV show Helix, but in the 70’s, not that its set in the 70’s, well I don’t think it is. Anyway, if that sounds interesting to you, you should pick it up ASAP! My weekend wasn’t quite as action packed as Will’s. On the Friday I literally spent all evening playing football manager. Once again my short attention span is evident as I didn’t go back to GTA Vice City Stories, but rather found myself on Football Manager for the majority of the week. Saturday my fiancee and I were guests at a wedding. It was a very fun day. Also a bit of a realization that in 2 month’s I’ll be up there. So I paid way too much attention to things. And finally on Sunday I went to my parents house to celebrate my dad’s birthday, I did manage to catch the ice hockey Olympic final. After this though I had 2 friends over and from 6pm it was watching basketball, watching Botchamania, playing wwe2k14 and finally watching Elimination Chamber. I’ll have thoughts and results of Elimination Chamber up shortly. So not so much geek for me this weekend, just important occasions finished off with some good old WWE. ← Titanfall Beta: Are you Ready For Titanfall?